“People Places Things” treats its characters a lot messier than most romantic comedies, which makes it delightful at times. It also makes it disappointing when the film falls into the same traps that plague romantic comedies. 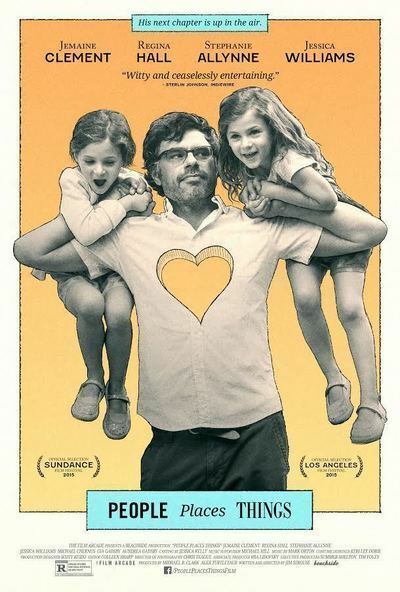 Its rambling nature hints this will be a leisurely stroll through the life of sad-sack cartoonist dad Will Henry ("Flight of the Conchords"’ Jermaine Clement), but at some point leisurely becomes lazy. Writer-director James C. Strouse builds a lot up a lot of goodwill, even when his characters are intolerable, because he stays rooted in a recognizable, relatable reality. All that goodwill gets squandered with one of the limpest climaxes and endings I’ve seen in years. Will Henry teaches a graphic novel class at the local university. During a birthday party for his 5-year-old twin girls, Will walks in on his wife cheating on him. This scene, which opens the film, is impressive in how it manages to juggle numerous types of humor. There’s the awkward embarrassment comedy between Will and his wife’s kept man, Gary (Michael Chemus); whose lack of shirt on his heavy-set frame seems to bother Will more than the affair. There’s the slapstick of the ensuing wrestling match between the two men, both of whom are too polite to put much effort into it. And there’s the broad comedy of the kids walking in on this scene which, if you recall, is unfolding in a house full of 5-year-olds. Fast-forward a year, and Will’s ex-wife Charlie (Stephanie Allynne) is living with Gary and sharing custody of the twins Clio and Collete (Aundrea and Gia Gadsby, respectively). Her relationship with Will is friendly, though his sarcastic comments about many of the things she says and does hint that his issues with her are unresolved. After one of his classes, Will gets the chance to be dragged back into the dating world when his student Kat (Jessica Williams) invites him to dinner. Citing the age difference, Will respectfully declines, a response made even more awkward when he discovers Kat is trying to hook Will up with her mother. “Eww,” says Kat at the thought of dating her teacher. “That’s disgusting!” Will alternates between agreeing with her and meekly admitting he’s not that bad looking. Kat’s Mom, Diane (Regina Hall) is also a teacher, though her subject is literature and her place of employment is the prestigious Columbia University. Will writes graphic novels and teaches at School of the Visual Arts, both of which draw Diane’s snooty scorn at her dinner table. After the totally botched date, Diane buys a few books from Will’s discipline and discovers their literary qualities. Of course, this leads to a tentative romance between the two. One would expect “People Places Things” to devote more time to this romance than it does. In addition to this, we must contend with Will’s relationship with his daughters (an admittedly good plotline, with the charming girls stealing every scene from their goofy dad) and dealing his ex-wife’s flighty personality (which gets real annoying, real fast). I understood what the film tries to do with Charlie, but at times she seems more a script convenience than a full-blooded character unsure about her future. Every scene between her and Will is antagonistic or detrimental to Will in some fashion. The film too often seems to takes his side rather than delve deeper into Charlie’s indignation about how she gave up her career for his author dreams. This makes the big climactic chat between them seem forced rather than liberating. While Gary is only hauled out for comic fisticuffs with Will, the extraneousness of his character doesn’t hurt “People Places Things”. It actually strengthens the comic tension. Diane’s lack of screen time is far more problematic. We like her, and Hall gives her underwritten role some beautifully tragicomic shadings (her performance will surprise anyone who only knows her from “Scary Movie”). She and Clement complement each other and their scenes really work. But “People Places Things” is far more preoccupied with the least interesting romantic relationship in the movie, which may actually be the point. The audience sees just how unworkable Will and Charlie are, yet the movie keeps throwing them together in an attempt to jar Will into letting go of his ex. For most of its 86-minute runtime, I liked enough elements of “People Places Things” to stay close to a positive review. Clement’s classroom scenes are quite entertaining, and his performance is a nice piece of understated comedy sprinkled with the sad cluelessness one has when a major relationship falls apart. His final scene with Kat, who looks up to him as a mentor, is very well done. And you can really feel his love for his girls, so you root for him to start again. The movie was working on me despite my protests. But then I got to that ending, or what passes for one. It’s so limp and wimpy that I expected another scene to follow it. Strouse was apparently going for ambiguity, but this is a movie that deserves a far stronger, more definitive fade out. But then again, perhaps the wimpy ending is exactly what wishy-washy Will Henry deserved. I, on the other hand, deserved better.